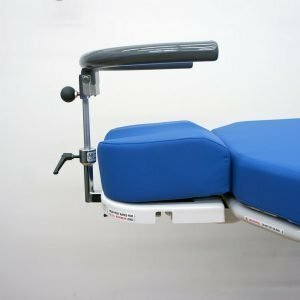 The optional surgical bar assembly allows the surgical bars to run the length of the seat, creating added room to attach or hang medical accessories. The assembly includes a pair of surgical bars (left and right) and mounts into the rear wells of the seat section of all TMM Series Stretcher-Chairs. The optional surgical bar assembly allows added room to attach or hang medical accessories. The assembly includes a pair of surgical bars (left and right) and mounts into the rear wells of the seat section of all TMM Series Stretcher-Chairs. *Also compatible with Knee Crutches (TMA18-15) and Heel Stirrups (TMA169-15) – Clark Sockets (TMA1515 also required for use with these two accessories. The optional Carter Hand Table, developed by Dr. Peter Carter, clips onto the surgical rail of the TMM4 and TMM5 Stretcher-Chairs. The Carter Hand Surgery Table is radiolucent, height adjustable, has an optional adjustable-length pad that adapts to individual patient arm lengths, and traction accessories are easily disassembled and conveniently stored in its compact sturdy case. Comes complete with height adjustable leg, 1″ foam pad, traction set and storage case. The optional Phenolic Arm and Hand Table features a height adjustable leg, has a firm cushion and is radiolucent, thus C-arm compatible. It mounts with specialized attachments to the surgical bars located on the back section of standard size TMM Series Stretcher-Chairs. This optional accessory is designed for TMM4X and TMM5X Stretcher-Chairs. IMPORTANT: This accessory limits Trendeleburg to 13 degrees and must be requested at the time of your initial order. This optional folding side table can be mounted on the right, left or both sides of TMM4 and TMM5 Series Stretcher-Chairs. Made of durable powder-coated metal with an easy-to-clean plastic tray which features two cup holders and a convenient pull-down button. Not recommended for models with the “X” seat tilt option. This optional folding side table (with removable cushion) can be mounted on the right, left or both sides of TMM4 and TMM5 Series Stretcher-Chairs. Made of durable powder-coated metal with an easy-to-clean plastic tray which features two cup holders and a convenient pull-down button plus a removable cushion. The rod below this optional support tray easily mounts in the wells located on either side of the seat section of all non-X TMM Series Stretcher-Chairs. 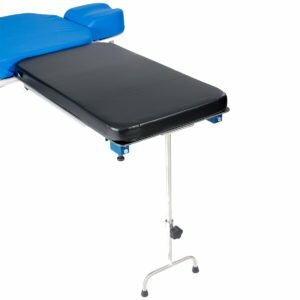 This optional tray mounts in either forward IV well (closer to foot-end) of non-X TMM Series Stretcher-Chairs and features adjustable height and 360 degree rotation for ease of positioning. This optional plastic utility tray mounts on the side rail of all TMM Series Stretcher-Chairs. Not recommended for use with models equipped with the “X” seat tilt option. This optional Anterior Wrist Rest is a one-piece horseshoe design that mounts to the TMM5 Stretcher-Chair’s articulating headpiece. It has a low-high height adjustment, a tilt feature, and it flips up out of the way.